Safe practices on Hotmail, Outlook, MSN and Microsoft account sign in. 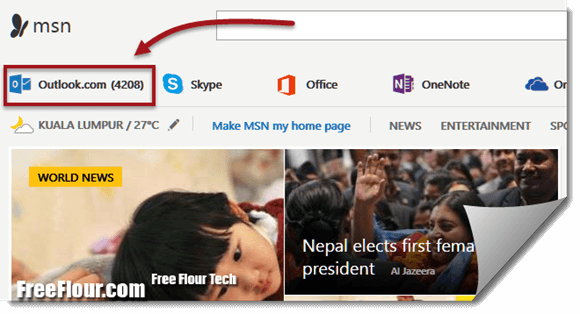 How to quickly go to Hotmail Sign in Page without going to MSN.com. Hotmail isn’t how it used to be a few years back anymore. It is now officially called Outlook. However, you can still access Outlook by going to hotmail.com. This has caused some confusion to the people who have no idea about the origin of Outlook and if Outlook is suppose to be Hotmail that they have been using. Most would stop entering their account password and signing in because they fear if this may be another malicious redirection. Well, be assured that Outlook is equivalent to Hotmail and belongs to Microsoft. The name Outlook was originally used in Microsoft Windows and Office Software which have no direct relationship with the classic Hotmail before the change. Now that they have all been combined, Hotmail can now be known as Outlook Mail, Live Mail, MSN mail or Microsoft Mail. 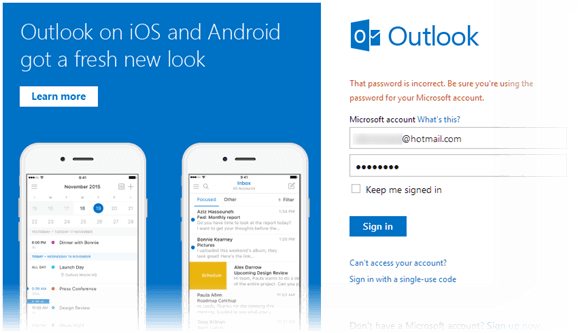 Hotmail.com isn’t the only gateway to access to Outlook email login. There are several other links that you can use to access to Outlook, but be aware that only these specific links are the correct and genuine one. Double check the spellings before entering to avoid getting yourself into any malicious website. The list of links below can be used to access to the hotmail.com sign in page. They will all be redirected to the same login page where after signing in will ultimately lead you to your email inbox. If you happened to be redirected to the MSN homepage after signing in, just click on the Outlook.com icon from the upper left corner of the page as shown in the screenshot below to access to your outlook email inbox page. If you receive this Hotmail error message and seeking for help, you can try one of the following solutions. Try to use another browser such as Mozilla Firefox, Google Chrome or Safari to perform Hotmail sign in. Update your existing browser as it may be compatibility issue. Try to clear your browser’s cache and temporary internet files and login to your outlook again. Check if your internet browser is currently allowing cookies. If it’s not, set to allow cookies and try signing in again. Look at your address bar when you are at the outlook or Hotmail sign in page. If the address starts with http, change it to https and try again. It should look like https://login.live.com/. If it originally starts with https, remove the “s” and try to sign in again. These issues have always been there when there were new changes that do not compatible with the old or outdated internet browsers. If you are still using the very much old IE8,7 or 6, you will want to upgrade yours to the latest one (Internet Explorer 11 or IE12). The very first thing to try is to check if you have your Caps Lock on when signing into Microsoft account. If it’s on, turn in off, otherwise you may have entered incorrect login info as it suggested. Well, this may happen if it has been quite a long time since you last signed in. To retrieve your account, you will need to go to the Hotmail sign in page, click on the “Can’t access your account” link below the password field, follow the on-screen instruction to proceed the account restoration process. Hopefully you gave a valid secondary email address or mobile phone number to Microsoft when you first signed up your hotmail account or otherwise you probably won’t be able to get back your lost account anymore. Well, if you did, they will use either the secondary email account or mobile phone as a medium to send you a piece of security code to be used to change your Hotmail account password. You can also choose to sign in with the single-use code which will be sent to your mobile phone provided if you have previously registered your mobile phone with Microsoft. By logging in Hotmail this way, you can skip the password process.